When we first started crate training with Rudy when he was a puppy he hated his crate, he was scared of it and would shake when locked in the crate for even a minute but eventually he loved his crate so do not be frustrated, dogs do learn to love their crates. It becomes a place of " peace " for them, a place of their own where they feel safe and can relax. Firstly, the crate you buy should be big enough for your dog to stretch out in and for a new puppy you most likely would want to start with a smaller crate. Placement of the crate is important, never place the crate in the basement where you will not be, this will cause seperation anxiety in most dogs and most likely a fear of the basement. You want your pup/dog to be able to see you and hear you, after all they are pack animals and they want to be with their packs where they feel most comfortable. At night if you do not want you pup in your bedroom with you in his crate, set him up in a room and have a radio playing softly or a ticking clock so your pup does not feel alone. To start crate training put something soft in the bottom of the crate and then place your pup/dog into the crate. Your dog is going to fuss so be ready, do not let the dog out, if you do let it out while he is fussing it will teach him/her that "fussing" is the way to get out of this crate so it will fuss more. Ignore all fussing. Allow your dog to settle and then after he/she settles wait 5 minutes and remove the dog from the crate, do not make a big deal about the dog coming out of the crate but do use loads for praise when the dog is inside the crate. You can give them a special chew or toy for when he is in the crate until you have him more comfortable in the crate then remove the toy/chew for safe reasons, I never leave chew toys unsupervised for fear of the dog choking or eating it then having a blockage in thier intestine. Now that you have your dog feeling more comfortable in his crate ( I call it their house and use the word " house " when asking my dogs to go in the crate) you can now increase the amount of time spent in the crate, start with 5 minutes of no fussing, then 10 then 20 then 30. Once you reach that 30 minute thereshould leave the room, go ouside or into a another room, wait and listen if you hear crying, barking or both do not come back until the dog has stopped; coming back in the room only teachs the dog that barking and crying works to bring you back. In a sense, if you respond to your dog crying or barking you are being trained by your dog. Again, once the fussing has stopped come back and let your dog out of the crate and don't make a fuss about it just open the door and let him out. Continue to increase the lengths of time out of the room and eventually you will be able to go out and do your shopping or whatever you need to do and your dog will be happy to stay in his crate. Your dog will learn to love his crate and he will go in there even without you asking for some nap time or just some peace and quiet. It can be a wonderful thing. I've just got a crate for Benson for him to sleep in when we visit relatives. Is it ok to leave him in there overnight? What do I do about his water supply? So far he doesn't want to go in there. If I coax him in with treats he goes far enough in to reach the treat then comes back out. I could get him in there by force but I'm reluctant to do so in case it makes him resent the crate. Should I try and get him used to sleeping in there for a few nights with the door open or should I just go gung ho and lock him in straight away as the guide suggests? The last thing you want is for Benson to resent the crate so I would not think force would be a good idea. It sounds like your first task is to get Benson to think if the crate as a nice place, so I would continue with the treats, leave the door open, spend time with him near the crate. When he gets to the point where he seems comfortable with it is when you can close the door. If he seems stressed over it, close it for a moment and then open it again. Since Benson had been having anxiety issues you may not want to push things. Good luck! I think I'll replace his bed with the crate with the widest door open so it is more of a bed and see how that goes. His anxiety is getting better although he has had a few relapses. Today I left him for 45 mins with the door closed and the baby gate in between the lobby and his kennel. I came back and he was still in the kennel but there was a carpet tile chewed to bits. Either he jumped over and then back, or it was magic! Think Skunstipe has give you good advice here. Can I just add that you can buy bowls which fit onto the door of the cage for his drinking water. Your local pet shop will probably stock them . If not you could try googling on line. I've replaced his bed with it and he is getting in it fine now. I'll leave it a few days then start moving it around the house with me and shutting the door for a few minutes. I did it! 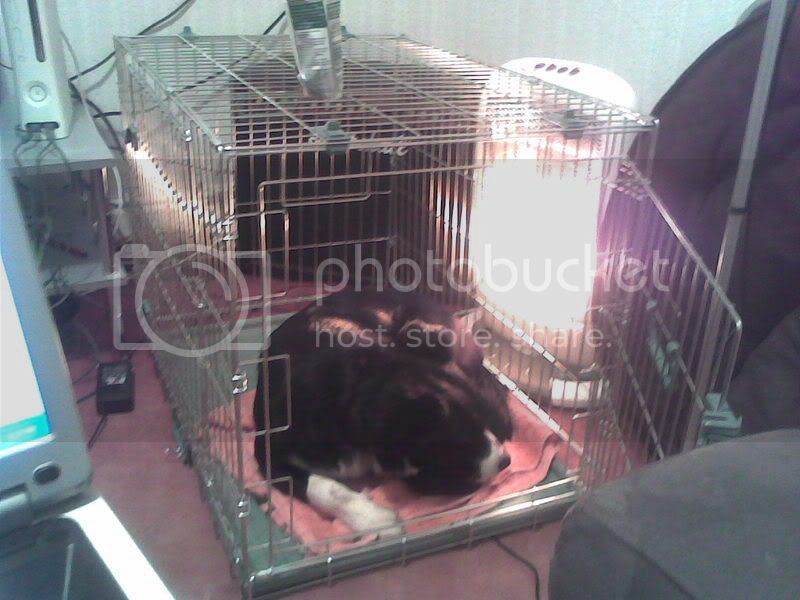 He's curled up in his crate now. I've been opening and closing the door for a few secondsa then rewarding him. Just need to start leaving him now. Door is closed and yes he's not happy. He's pacing round and scratching at the door and whining. Should I just be ignoring him, cos I am. The original post says to praise him when he's in but I don't want to teach him to whine for praise.